Now in its third year, Best Buy's Blue Label program is something of a time capsule for fickle consumer tastes. Being the behemoth that it is, the retail giant hands PC makers a wishlist of specs, design flourishes, and aggressive price points -- all with the promise of selling the finished product exclusively. The 14-inch Toshiba Satellite E305 has had more than a few facelifts since we reviewed the E205 last year, and reminds us that nowadays, shoppers prefer metal to glossy plastic, and seamless touchpads to large mouse buttons. The E305's got all that, along with a Sandy Bridge processor, USB 3.0, a Blu-ray drive, a 4G radio, and the second generation of Intel's Wireless Display technology. For $899, that all sounds dandy, but as we know, a laptop doesn't always equal the sum of its parts. Is it as much of a steal as you'd imagine it to be? Head on past the break and see for yourself. In its third collaboration with Best Buy, Toshiba scrapped almost everything that made last year's E205 distinctive – the oversized touch buttons, extended hinge, and, yes, its glossy, Smurf blue finish. But one thing hasn't changed: it's clear Toshiba and Best Buy still want their budget creation to look more expensive than its $900 price tag. They almost succeeded. The aluminum lid makes a striking first impression, as do the matching chassis and chrome accents. Meanwhile, the etched checkered patten makes the design seem richer and has the added benefit of repelling fingerprints, though it also creates the optical illusion that the chassis is thicker than it is. And while the "champagne" color isn't so aptly named -- it's a cooler, silvery shade in all but the dimmest light -- we think it's a good match for the textured metal surfaces. The overall effect is modern, though we wouldn't go so far as to call it futuristic. Most of all, we're pleased that Toshiba tucked its all-caps logo in a corner of the lid, as opposed to emblazoning it front-and-center as it's wont to do. And yet, when you lift the lid the notebook suddenly looks less refined. We stared down this laptop for a long time, trying to put our finger on what made us have a change of heart. Then it came to us: the plain, slightly shiny keys make for an incongruous match for the metal-clad body. The keyboard's backlighting helps distract from its plasticy finish, but it only kicks in if you're in a dim room or touch the keyboard. Likewise, the touchpad has a hard, plastic feel though it does mirror the chassis' checkered pattern. All this is hardly a deal-breaker, of course, especially when we're talking about a $900 system. It just seems to us that if Toshiba and Best Buy were going to go elegant on this one, they should have gone whole hog. We're told that Best Buy insisted the E305 weigh less than five pounds, and it comes in just under the limit at 4.95 pounds. That's not bad, considering that a metal-clad 13-inch notebook could easily top five, although what the E305 shed in pounds it's kept in girth – at 1.2 inches thick, it's still on the chunky side. On the bright side, though, it feels sturdy in the hand, thanks to that rock-solid aluminum body. And because the battery sits flush with the system, there aren't any bulges on the bottom, which makes it easy to slip under your arm while walking. And if for some reason the durability doesn't hold up, it comes with a relatively long two-year warranty (not including accidental damage / klutz protection, of course). The E305 offers a healthy selection of ports, including three USB 2.0 ports, along with a USB 3.0 port that's also home to Toshiba's sleep-and-charge technology, which allows you to charge USB-powered gadgets even when the notebook is asleep. Similarly, the headphone jack will charge a music player even if the laptop isn't powered on and fully awake. Besides those, the E305's got HDMI and VGA output, a mic jack, an Ethernet port, and a memory card reader. 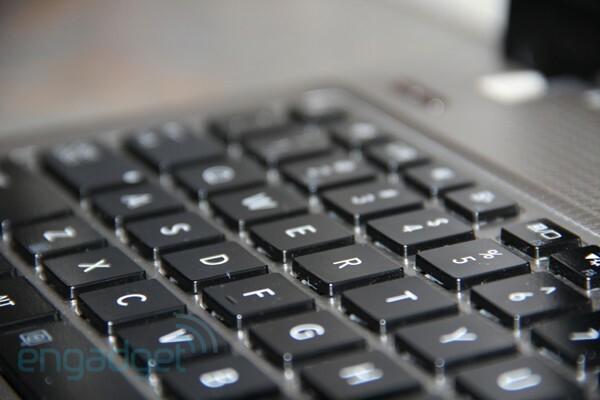 We won't mince words: the E305's chiclet keyboard is supremely comfortable. As much as we kvetch about how the keyboard looks chintzy, it's well spaced, with amply sized left and right Shift buttons. Typically, it takes us a day or two to warm up to a new keyboard, but this time we barely had a learning curve, and were typing 94 words per minute (a good score for us) not long after unboxing the laptop. What's more, the panel felt sturdy through some bouts of furious typing, and even with our pounding the keys barely made any noise. Unfortunately, we can't say the same about the trackpad. For the first time, Toshiba opted for a clickable pad -- a concept that's apparently easier to imitate than successfully pull off. The touch area is divided into left and right click zones, with a neat line to make it obvious where your finger should be. The problem is, it constantly registered right clicks, even when our finger was planted firmly on the left side. And because the buttons are narrow, it's easy for your finger to land on a too-high spot where clicks don't register at all. After about a week of testing, we had more luck, but really, it's not a good sign when a successful left click is enough to make you feel like you've won. The trackpad is certainly spacious enough for multi-touch gestures, and also includes a narrow, invisible strip on the right edge for single-finger scrolling. We have to give credit where it's due: given all the hassle we ran into just trying to left click, gestures felt surprisingly smooth, and worked reliably. 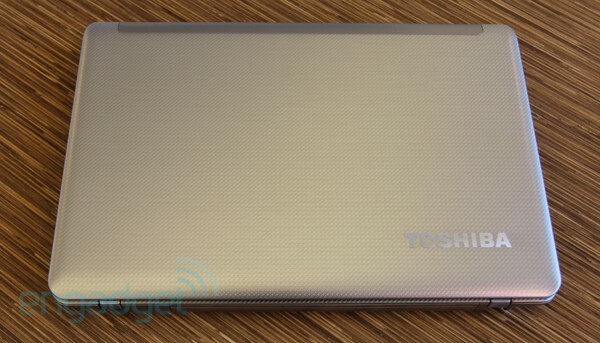 The 14-inch uses Toshiba's TruBrite technology, which means, marketing speak aside, that this is one glossy panel. 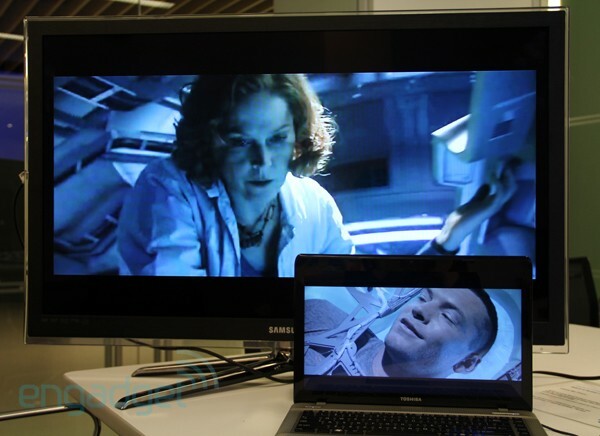 Given that, we were pleasantly surprised at how well we were able to follow a movie while watching from odd angles. We had no problem making out the action from the far left and right sides, though we had a little more difficulty watching a movie head-on with the screen dipped forward -- the more we lowered the screen, the more washed out the colors appeared. 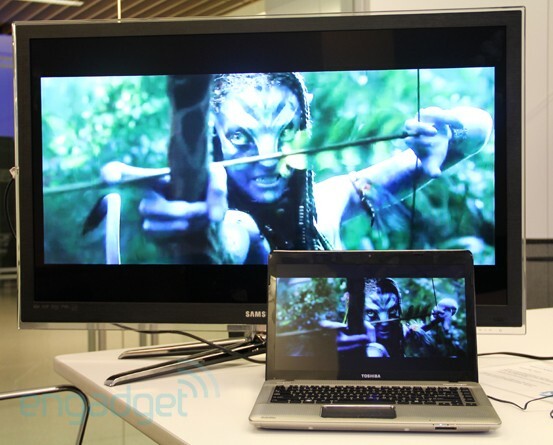 The 220-nit display was bright enough for us to comfortably work and watch movies for long stretches, though splurge and you'll find similarly sized notebooks with more eye-popping screens, such as theSamsung Series 9. And although the E305 has a Blu-ray player, you'll be limited in how much you can enjoy those high-def movies, as the screen has a run-of-the-mill 1366 x 768 resolution. That said, Blu-ray movies looked crisp and played smoothly at full screen with faithful color reproduction. The E305 is endowed with Dolby technology, and not the Harman Kardon audio you'll find in Toshiba's high-end Qosmio systems. You're not going to hear any pounding bass notes here, but we've also heard far tinnier speakers in our day. As for the volume, the speakers were loud enough that we could still hear The Doors and The White Stripes from across our apartment, and over the sound of our noisy printer and Joan Rivers dissecting the royal wedding on TV (yes, really). In short, the speakers will be powerful enough when you're hanging out alone or with a few friends, but you'll want to fall back on external speakers the next time you decide to host a rager. The E305's webcam stops short at VGA resolution. Though that's fine for video chats, a fair amount of detail gets lost in still photos. And although the lighting in our pictures and clips looked natural, the colors took on a slightly bluish tint. The good news is that setting up the webcam for facial recognition -- a process that requires you to align your face with an onscreen avatar's -- took all of 30 seconds, and the notebook recognized us instantly when we later used it to log into our system. Like the E205, the E305 packs Intel's Wireless Display technology, which lets you mirror your display (and whatever HD content you happen to be watching) on an HDTV or monitor -- sans cables, of course. This time, though, it features the second generation of WiDi, which can stream 1080p content, a step up from last year's limit of 720p resolution. We're happy to report that WiDi is as easy to set up as always. The notebook comes bundled with a small adapter made by Netgear ($100 on its own) that you plug into the wall with an AC adapter and then connect to your monitor or HDTV using an included HDMI cable. Press the power button in the back and then push the Wireless Display launch button on the E305's keyboard deck (that's the one on the far right). After you press the launch button, you might notice a pause of up to 10 seconds while your laptop finds the adapter. When it does, you'll have to manually select the adapter you want (in the event you bought more at $100 a pop to use with other TVs in your home). That's odd, given that laptops can automatically connect to familiar wireless networks. In this case, though, you'll always have to manually select the adapter. Played at full screen, 1080p video lagged ever so slightly, but we ultimately didn't find that minor slowdown distracting. We do suggest keeping your notebook out of sight -- as you can see below, the laptop is always one step ahead, and the video doesn't align perfectly with what's playing on TV. As it turns out, during the writing of this review, Intel started supporting DRM-protected DVDs, Blu-rays, and some online content via a free driver update. Unfortunately, though, that upgrade's only available for laptops with Sandy Bridge processors (like this one), which only started shipping this spring. That won't make a difference to people thinking of buying this laptop or a similar one, but it ought to be a bummer for readers stuck with last year's Wireless Display technology. This won't surprise you, but E305, like other notebooks refreshed this year, graduates to an Intel Sandy Bridge processor -- a 2.3 GHz Core i5-2410M CPU, to be exact. 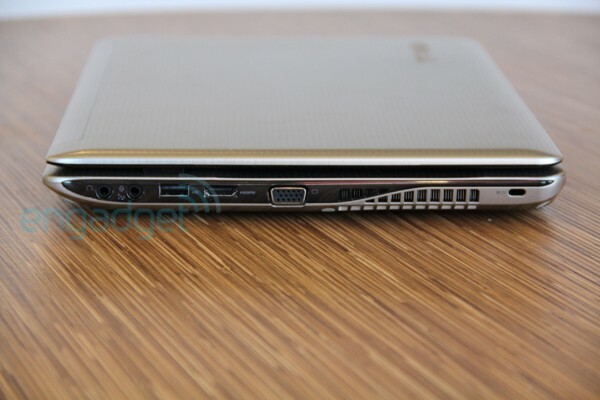 In addition, the notebook runs Windows 7 Home Premium (64-bit) and comes with 4GB of RAM and a 500GB 7,200RPM drive. As for the HDD, it employs hybrid drive technology, which combines traditional hard drive storage with 4GB of flash memory that's used to remember commonly used documents and applications -- in theory making them quicker to load. During a week of testing, the E305 was able to keep up with us while we ran Tweetdeck at full screen and used Chrome for email, Facebook, online banking, YouTube, and keeping up with various blogs. All this while running a full system scan using Norton Internet Security, mind you. In short, the performance was brisk, though frankly, it's hard to fully appreciate a laptop's power when a wonky touchpad makes even the most rote tasks feel painstaking. As for graphics, the E305 has Intel's integrated HD graphics -- a staple among low- and mid-range laptops. Its score of 4,547 in the gaming benchmark 3DMark falls thousands of points short of what you'd get from a discrete card, but it still trumps many of the scores we've seen from similarly sized machines with integrated graphics. In real-world terms, that's just fine for basic photo editing and playing simpler, not-too-graphically-intensive games. Rounding out the E305's list of specs is an Atheros wireless-N radio and... WiMAX support! Not something you typically find in a mid-range consumer laptop, eh? Though Toshiba is shy about saying just who its partner is, you'll get your answer just by poking around the menus -- it runs on Clearwire's network, of course, under Sprint's brand. You can activate the service in Best Buy, but the notebook also comes with a utility from which you can subscribe through Best Buy. If you all you want is a day's worth of connectivity, you can snag a day pass for $10, but you can also sign up for a month to month plan or a two-year contract. Either way, those options both come out to $45 a month in data fees. 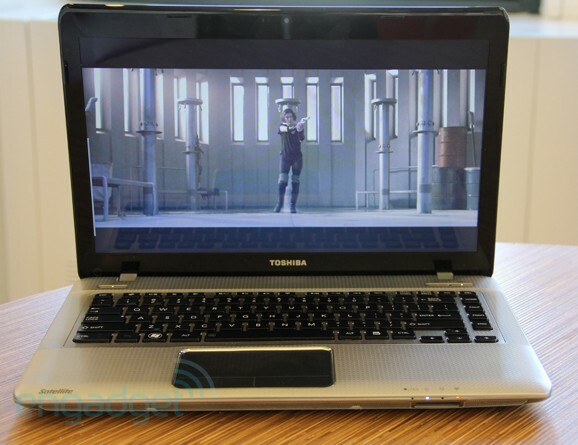 Toshiba rates the E305's six-cell battery for up to seven hours and ten minutes of battery life. In our own test, which involves playing the same video at 65 percent brightness with WiFi on, we eked out five hours and seven minutes. Throughout, the laptop's temperatures stayed relatively cool. After playing a Blu-ray movie for awhile and running a virus scan, the fan whirred loudly, and the vent on the right side became warm -- though not hot -- to the touch. The right side of the palm rest inched up a few degrees, too, while the left side (the one farther way from the vent) stayed downright chilly, thanks to that aluminum finish. The E305 comes with its fair share of bundled software you didn't ask for, much of it Toshiba-branded utilities, such as a PC health monitor and proprietary media player. Our one complaint is that the launch pad for the webcam software sits on the edge of the desktop and flaps out when you roll over it, which frequently got in our way. As for third-party software, though our review unit came with Norton Internet Security installed, those of you who pick one up through Best Buy will get a complementary one-year subscription to Kaspersky Anti-Virus software (not to mention, 90 days of Geek Squad support). Not to excluded, Best Buy bundled some software of its own, including that WiMAX connection utility we told you about and an app store that leads you to a place where you can spend more money download various software for your spankin' new PC. There's no question Toshiba's Satellite E305 has a lot to offer: a striking aluminum body, Intel's easy-to-use Wireless Display 2.0 technology, Blu-ray playback, USB 3.0, cool operating temperature, and a Sandy Bridge processor more than powerful enough for everyday use. It's a crying shame, then, that something as basic as a touchpad could make this laptop stumble. Were it not for its jumpy, imprecise trackpad, we would have awarded it a higher rating, and the only reason we didn't dock it more is because this is something Toshiba can address through a driver update, as other companies have done after enough people wailed about the touch experience. Given all of its redeeming qualities, we suggest at least heading to a Best Buy store and handling one in person. But if you find yourself frustrated by unintended right clicks, remember that it's not likely to get easier with use -- not without a nudge from Toshiba, anyway.